Bharat Sanchar Nigam Limited (BSNL) has Launched new Public Grievance (PG) Cell website for its valuable BSNL customers to lodge a complaint on related to various BSNL product telecom services. The BSNL Competent Authority has well designed for its customers to lodge a complaint from any Telecom Circle or District Level on various Product services. This service has introduced in all Telecom Circles and SSA level (District Level) Secondary Switching Areas to determine the BSNL Customers complaints for immediate disposal without any long time taking delay. As usual if any BSNL customer has any type of complaint on various products they can lodge it by simple dialing to Toll Free Numbers 198, 1500, 1501, 1503 or booking complaint via BSNL Executive. Most of the cases i.e (99%) are rectified immediately within 24 hours of time whether it is Broadband/Landline service faults. BSNL Customers can contact their nearest Customer Service Center (CSC) available in each and every locality of City across India where complaints and bill services can be done. CASE-I: BSNL Broadband Fault from 3 days, Cable Cut by Municipal corporation. Solution: I Registered complain at 198, in Morning 8:30 AM, I Got call from BSNL Office at 10:15 AM and Lineman visited home around 11:00 AM, after some test he said there is cable fault and it will be resolved soon by tomorrow I waited for next day and then call Outdoor Jr. Telecom Office and he assure problem will be resolved today but not resolved so finally i booked complain at BSNL Public Grievances (PG) Complaints New Website http://mis.bsnl.co.in/pgs/internet/pgwebregn.asp and next day i got call from Local District headquarter main office and they conform my identity and same day BSNL officer came with 3 Lineman and restored the fault by making joint after cable cut by Municipal corporation JCB. Solution: I was getting problem of Indoor Signal so i booked Public Grievances (PG) Complaints on Website http://mis.bsnl.co.in/pgs/internet/pgwebregn.asp regarding GSM Network Problem. Next day BSNL Mobile wing person visited my Home and checked RF Signals in my Locality and home, after some alignement changes at BTS of my Locality problem is resolved. After booking a complaint on Toll Free Numbers if the Customer complaints are not resolved or BSNL staff/Officials are not attended the problem and extending days for solving problem then where to BSNL Customers. 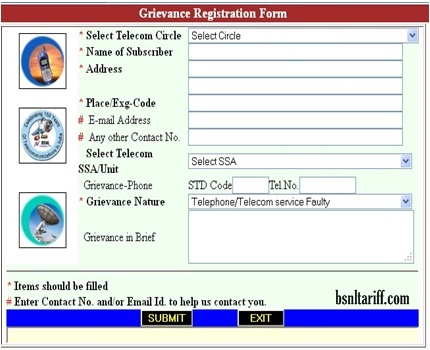 Here BSNLTariff provides a way to bring problem to the higher level Officials by registering a complaint online at Newly launched BSNL Public Grievance (PG) Cell website without going for any paper work or approaching near by Customer Services Center or Zonal Offices. This BSNL Public Grievance Cell website really amazing and working beyond BSNL Customer imagination. BSNL Customers don’t need to work hard for booking a complaint on BSNL PG Cell, simply visit …. and fill the information like Telecom Circle or State, Customer Details (Connection Booked on), Alternative Contact Number (Mandatory) on which BSNL Authority will contact you. Bring up detailed complaint related to BSNL product and submit it. Immediately you’ll get Complaint ID, record it safely for further reference. That’s it, you’ve done now its time for BSNL Public Grievances website how effective work 100%.